In our towns and cities, pest birds are becoming an increasingly common presence- meaning bird netting systems are more vital than ever. The effects of their presence of the resultant bird fouling pose a direct risk to public health & safety and can cause serious damage to buildings, bridges and other structures. There are many different species of pest birds in the UK, but three of these pose a particular problem, especially in urban areas: feral pigeons, gulls, and starlings. Since there are so many of these birds around- especially pigeons- they tend to roost on any high surface they can find. Ledges of buildings are a popular choice for pest birds, but other areas such as beneath canopies or under bridges also present a tempting spot for them to land or even to build their nests. In most cases, though, the end result is the same- a large amount of bird fouling and other debris that can cause foul odours, as well as constant noise pollution from roosting birds. Not only does this issue look disgusting, but it can also pose a serious risk to people nearby. Not only can bird fouling increase the risk of a number of diseases, but it can also cause people to slip and fall. The last thing any business owner wants is for an employee or member of the public to have an accident and file a lawsuit- so it’s best to prevent this issue from affecting your property. Fortunately, Pest Solutions’ bird netting service is the ideal way of keeping birds at bay! Of course, not all wild birds are seen as pests. However, when large numbers of birds nest or roost in one area and produce large amounts of faeces and debris, then they clearly pose a problem- and that problem needs to be dealt with via professional pest control solutions. If you try to tackle the issue by yourself, then you will end up spending countless hours- as well as a lot of money- cleaning up the mess caused by these pest birds. What’s more, you won’t have dealt with the root of the problem. Instead of wasting your time playing catch up, it’s time to stop the issues that pest birds cause for good. Bird netting is an effective long-term bird control solution that can easily be scaled up or down to suit your individual needs. From canopies, beams, and eaves to rooftops, or even entire building elevations, there are so many different bird netting systems to choose from. At Pest Solutions, we typically use UV stable polyethylene knotted bird netting, because it provides heavy-duty, long-lasting protection. 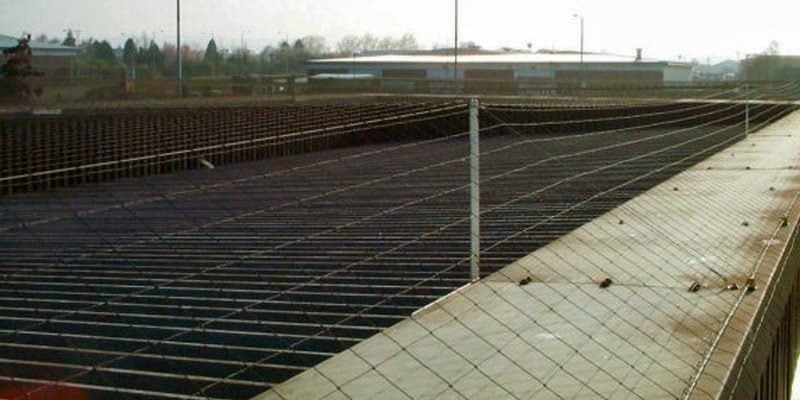 This netting can cope with the often harsh weather we get in the UK, and so long as it is properly set up, should have a lifespan of over ten years. Alternatively, we also offer polypropylene extruded plastic netting which is usually used to exclude pest birds from homes and gardens to protect orchards and other types of crops. Not only are professional pest bird netting systems remarkably effective, but they are also discrete, too. When installed correctly, they have very little effect on the appearance of a building, but still keep pest birds well away. In fact, it is the only pest deterrent solution that can provide a 100% success rate in even the most highly infested areas- making it the obvious choice for anyone serious about tackling a pest bird infestation in their area. For many years now, we have provided our UK customers with tried-and-tested pest bird control solutions that deliver top results. Our high level of expertise means we can easily adapt our pest bird netting solutions to suit your unique needs, as well as complement the netting with additional pest deterrent systems. All of our technicians are highly trained and experience and come with PASMA and IPAF certifications. This means that they are fully equipped to carry out work at heights safely and still provide a top-quality service even in the most awkward of spaces. If you would like to learn more about how our bird netting service works or to book a free pest bird control survey, then please don’t hesitate to get in touch at any time. The Pest Solutions team is made up of skilled, BPCA-qualified professionals and support staff. We are on hand 24/7 to assist with any pest control-related concerns you might have and come up with unique solutions to suit the precise needs of each and every client. Even if bird netting turns out not to be the right approach for you, we can still help you find the ideal method for keeping pest birds away from your property. Let us take care of all your pest control needs for you. Phone Pest Solutions today on 0800 027 2555 to arrange a FREE Survey, get helpful advice or have a service visit form a member of our team. You can also find the details of your local Pest Solutions branch here.